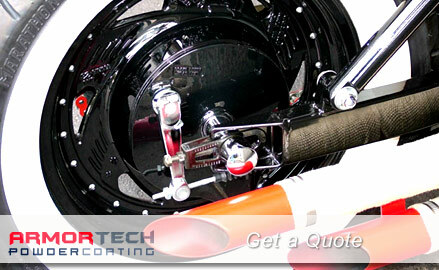 Get a Powder Coating Quote Fast & Easy! We can provide you with a quote by either phone or you can use our simple online form below. For an accurate quote, please be as specific as possible. Example: size of wheels, how many, what finish is on them now, what finish do you want? For shipping instructions please visit our Shipping Info page. Message: Describe what you would like us to Powder Coat Please be as specific as possible (i.e. car/motorcycle model, wheel size, quantity, color, etc) . At ArmorTech, we sit down with every one of our customers and make detailed notes of their wishes. For out-of-area jobs we prefer “live” phone calls first, not just to document your special needs, but to hear your voice as well. It’s our view that the best way to earn your business is to speak with you one on one. We also invite you to visit us at any time and view our shop and showroom. Shop Hours: M-F 8a-5:30p. Saturdays by appointment only.